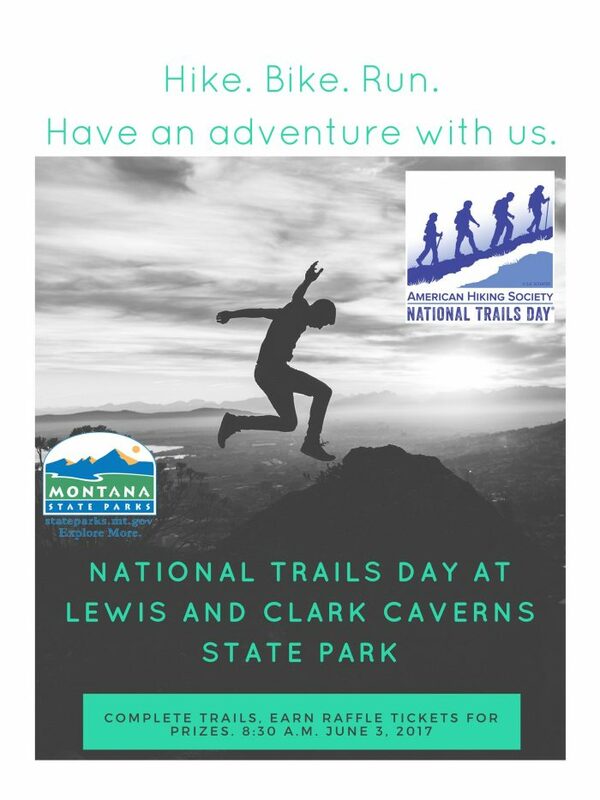 Montana State Parks (stateparks.mt.gov) will host a National Trails Day® event at Lewis & Clark Caverns State Park on Saturday, June 3rd from 8:30am to 12:30pm. American Hiking Society’s National Trails Day ® is the country’s largest celebration of trails. In recognition, join us at Lewis & Clark Caverns State Park to enjoy a hike on one of the park’s trails. The park offers 10 miles of trails for both hiking and mountain biking ranging from easy to difficult. National Trails Day® Participants will earn tickets to enter into a drawing for a variety of prizes. Visitors with mobility issues are invited to come out, bring a picnic basket, binoculars and earn tickets by spotting different bird or plant species in the park. Registration is at 8:30am at the group use pavilion in the park’s campground area. All participants should be prepared for a day in the sun. Please wear appropriate clothing, sunscreen, footwear, snacks, and water. For a description and map of the available trails visit Lewis & Clark Caverns State Park Trails System For more information call the park visitor center at (406) 287-3541. Montana State Parks (stateparks.mt.gov) will host a National Trails Day® hike at Makoshika State Park on Saturday, June 3 at 10am. Celebrate National Trails Day® with a hike on Makoshika’s Vista Trail, a road-to-trail project that provides 3 miles of non-motorized trail accessing some of the more remote areas of the park. Spot wildlife and enjoy beautiful wildflowers and scenic vistas as you participate in the country’s largest celebration of trails. The 4-mile roundtrip hike is rated as moderate in difficulty. Please wear weather appropriate clothing, sturdy footwear, and bring water. Sunscreen and insect repellent are suggested. Sponsored by the American Hiking Society to occur each first Saturday of June, National Trails Day is the only nationally coordinated event designed to unite all muscle-powered trail activities with the goal of connecting people to the more than 200,000 miles of trails in the United States, which are essential to connect people with nature, conserve open space, provide biological corridors for diverse plants and wildlife, and for the health of Americans and our natural environment. For more information call the visitor center at (406) 377-6256. When: Saturday, June 3, 2017 at 10am. Where: Makoshika State Park, 1301 Snyder Avenue, Glendive, MT. Makoshika, the name of which is a variant spelling of a Lakota phrase meaning “bad earth,” is Montana’s largest state park Encompassing 11,583 acres. Known for its pine and juniper studded badland formations, Makoshika also houses the fossil remains of such dinosaurs as Tyrannosaurus Rex and Triceratops. Montana State Parks (stateparks.mt.gov) will host a National Trails Day Hike® at Bannack State Park on Saturday, June 3 starting at 10am. Help celebrate the American Hiking Society’s National Trails Day by joining Americorps member Mitch Harlan on a hike that will provide wonderful views of Bannack & the surrounding countryside. Learn about Bannack’s storied past, the natural history of the region, and enjoy a splash of color from the spring wildflowers. This 2.2-mile hike will leave from the visitor’s center at 10 am, and take approximately 2 hours. The trail is moderately difficult with a decent amount of elevation change. Please wear appropriate shoes, dress for the weather, and bring water and sun screen. For more information, please call the park visitor center at (406)-834-3413 or email bannack@smtel.com. American Hiking Society’s National Trails Day ® is the country’s largest celebration of trails. Each year, on the first Saturday of June, the American Hiking Society and the trails community invite Americans of all ages and interests to find their own adventure on National Trails Day® and discover their unique story at one of the thousands of events hosted throughout the country. Bannack State Park, located near Dillion, MT., is a National Historic Landmark and the site of Montana’s first major gold discovery on July 28, 1862. This strike set off a massive gold rush that swelled Bannack’s population to over 3,000 by 1863. As the value of gold steadily dwindled, Bannack’s bustling population was slowly lost. Today, over 50 original buildings line Main Street and their historic log and frame structures recall Montana’s formative years.